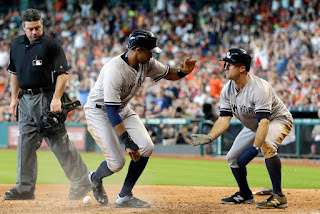 After taking two out of three against the Tigers and winning the last game of a three-game set against the Phillies, both in New York, the Yankees traveled to Houston on Thursday to begin a 4-game set at Minute Maid Park in Houston. After being completely dominated by one of the aces in the game, Dallas Keuchel, the Yankees took Games 2 and 3 by going ahead in the final frames but lost Game 4 after McHugh outpitched Michael Pineda. Coming off a loss in Seattle where he pitched only six innings and gave up five runs, Houston ace Dallas Keuchel matched up with New York’s Adam Warren, which might have been Warren’s last start before moving to the bullpen. Keuchel came in as one of the best in the game, with a 8-3 record, 2.35 ERA, and 83 strikeouts in 109.1 IP. Adam Warren came into the matchup after notching his 5th win against the Tigers in a 2-run, 8-inning effort. Many fans realized the miserable matchup the Yankees would have against Keuchel with McCann and Gardner resting. 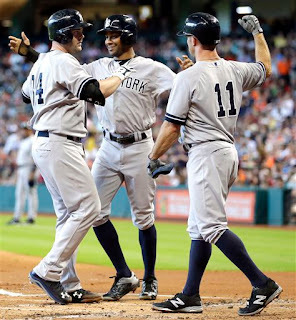 The first inning started ominously as after giving up a single to Chris Young, Keuchel proceeded to strike out Headley, Alex Rodriguez, and Teixeira consecutively. Houston struck first in the 2nd inning on a Preston Tucker double, with Colby Rasmus racing home all the way to first. In the 4th, Jose Altuve doubled to deep left after leading off, and scored on a Colby Rasmus sacrifice fly. Keuchel continued to dominate hitters, not even letting a Yankee reach second base until the 9th inning when the bases were loaded and Jose Pirela came to the plate. Astros manager AJ Hinch let Keuchel stay in the game, but Pirela grounded out to third in a fielder’s choice to end the game. Keuchel pitched a 6-hit, 12-strikeout shutout and won his 9th game. Houston sent out Vincent Velasquez, a rookie, into Game 2 to face Not-so-nasty Nathan Eovaldi. After getting destroyed in Miami, Eovaldi pitched a decent game in Detroit, allowing 2 runs in 6 innings and picking up the win. Velasquez’s first three starts all resulted in no-decisions. Houston struck first on a Carlos Correa single scoring Conger in the bottom of the third inning. Evan Gattis added on a single that scored Jose Altuve in the 6th. The Yankees had not threatened at all up to this point. However, in the top of the 7th, after a Brian McCann lineout, Beltran and Garrett Jones hit back to back singles. Velasquez was taken out by Astros manager A.J. Hinch. In came Will Harris. Chris Young stepped up, and on a 1-1 count, hit a THREE-RUN HOMER into left field, putting the Yankees all the way ahead 3-2. Chasen Shreve took over for Eovaldi, and Shreve doing Shreve, he struck out the side. Justin Wilson, now Girardi’s 8th-inning man, came in and got 2 outs before walking Luis Valbuena. Dellin Betances had to came in, and struck out Evan Gattis after Valbuena stole second. Betances pitched a hitless 9th for his sixth save. Houston sent Brett Oberholtzer into Game 3. He owed a 2-1 record with a 2.81 ERA. He was up against Masahiro Tanaka, who was in his 5th start after returning from his 1-month stint on the disabled list. Brett Gardner led off the game with a double. After Chris Young and A-Rod walked, Mark Teixiera popped out. In what seemed like a potential waste of an inning, Brian McCann stepped out and promptly, on a 1-0 pitched, SMASHED the ball into the right field stands for a GRAND SLAM. Ohhhh McCann can! New York led 4-0. Chris Young added to the damage with a 1-out, 2-run home run in the second inning. The next batter was A-Rod. Now, as replays would show, Oberholtzer was extremely frustrated with his pitching after Young’s home run. He said words that I couldn’t write on this blog. Obviously frustrated, he threw his next pitch at A-Rod, towards his lower half and knees. Home plate umpire Rob Drake immediately saw this as intentional and tossed him out. 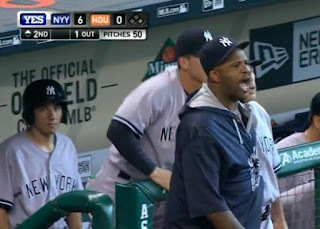 Sabathia was halfway out of the dugout when he saw this and it was great seeing him come to A-Rod’s defense. Girardi was fired up as well and both benches were warned. Tanaka, with a 6-0 lead, seemed on his way to another win. However, this was not to be. A Chris Carter double and a Springer single decreased the lead to 6-2 in the bottom of the 2nd. In the bottom of the 4th Chris Carter hit a solo shot. Then, in the 5th inning, Correa hit a 2-run home run, decreasing the deficit to 1 for the Astros. Then, the next hitter, Altuve, hit a solo shot over the left field wall and the 6-0 lead was gone as the game was then tied. Bryan Mitchell came in after Tanaka finished the 5th and he would receive a no-decision. Mitchell pitched well, striking out 3 in 1.1 IP. Chasen Shreve loaded the bases after taking over for Mitchell in the 7th, but struck out Jon Singleton to end the jam. Pat Neshek took over in the top of the 8th for Houston. Gardner and Young reached on a single and error, respectively. After A-Rod flied out, Mark Teixeira smashed a double to left field and the Yankees led 8-6. Chase Headley hit a solo shot on the top of the 9th to give Betances a three-run lead, and he closed it out to earn his 7th save of the year. Shreve earned his 5th win of the year with his relief efforts. Houston sent out Collin McHugh to salvage a split and indeed he pitched a gem. In a game where both Pineda and McHugh both pitched eight innings, the Astros managed more offense and they won 3-1. New York struck first on a single by Gardner that scored Stephen Drew. However, Garrett Jones and Gardner misplayed a ball in center and that led Carlos Correa to double and then score on a “Little League” homerun. He was not credited with a HR because Gardner’s error led Correa to round the bases. Houston added an insurance run in the 8th to extend the lead to 3-1. New York then weakly ended the game against Houston by not even threatening Luke Gregerson, who earned his 18th save of the year for Houston. The Astros and Yankees split their 4-game set. The Yankees only managed two hits and two walks against McHugh. Pineda pitched a 107-pitch complete game, but lost due to a lack of New York offense. Brett Gardner continued his extremely hot hitting. He has hit .448 in the last seven games with 13 hits in 29 at-bats and 6 RBIs. He has also walked 5 times, and his OBP is .529 going back to the last seven games. Chasen Shreve and Justin Wilson continued to pitch very well in Games 2 and 3, pitching a combined 4.1 innings in relief and did not give up a run. With Miller’s return to happen in the next couple weeks, it’ll be interesting to see who gets the 7th inning. Who will go to the pen? Will it be Sabathia, Warren, or Eovaldi? It looks like Sabathia is off the hook and most likely it will be Adam Warren. The bloggers at Bronx Bombers Blogger have reason to believe that Eovaldi’s powerful fastball could put him useful as a 1-inning reliever, but it looks like Shreve and Wilson have done well in that aspect. Chris Young came back to his hometown, and with his family in attendance, he played really well against the Astros. He had six hits in the first 3 games, and especially his go-ahead, 3-run home run gave New York the win in Game 2. Jacoby Ellsbury is scheduled to begin a rehab assignment this week, which means we could see him back by the end of this week or early next week. That is good news for the team, as Carlos Beltran and Garrett Jones should not have to play in right field, ever. The Yankees (41-35) will travel to Anaheim for a three-game set against the Angels (39-37). Sabathia, Nova, and Eovaldi are scheduled to be the pitchers in the games. CC Sabathia (3-7, 5.65 ERA) will face off against CJ Wilson (5-6, 3.92 ERA) in Game 1 on Monday, June 29th starting at 10:05 PM Eastern.